S I G N & D I G I T A L G R A P H I C S • March 2018 • 61 Records Keeping good records saves time on the reordering of additional graphic sets, finding and processing artwork and placement during installation. As I mentioned earlier we keep organized customer folders with proofs and nota- tions to make reorders quicker. We also keep the sample prints, color notations and any artwork guidelines in their cus- tomer folder. Digital files are also kept organized so we can quickly find them. We use a cat- aloging software called Cathy Catalog. All digital artwork is saved to a company folder within a working drive. 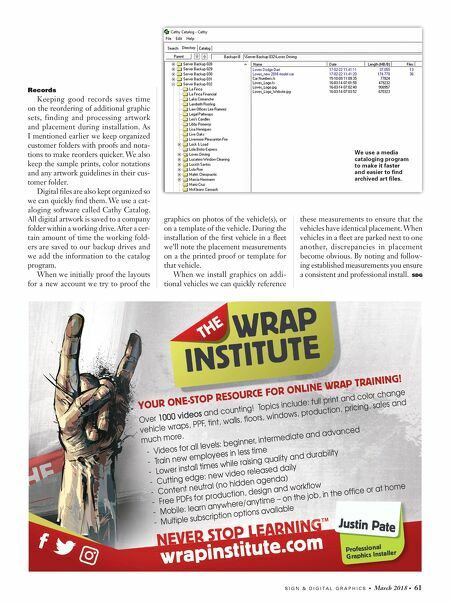 After a cer- tain amount of time the working fold- ers are saved to our backup drives and we add the information to the catalog program. 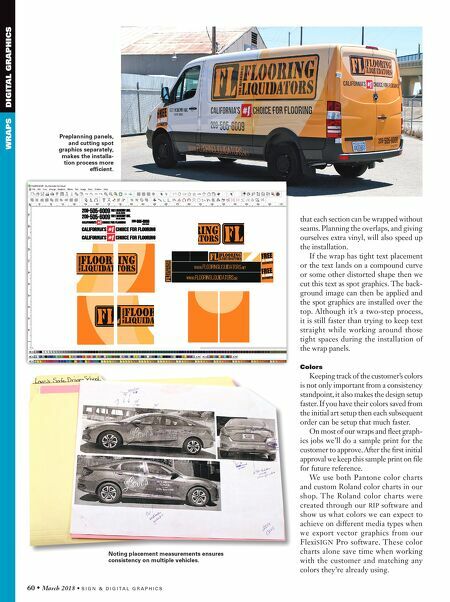 When we initially proof the layouts for a new account we try to proof the graphics on photos of the vehicle(s), or on a template of the vehicle. During the installation of the first vehicle in a fleet we'll note the placement measurements on a the printed proof or template for that vehicle. When we install graphics on addi- tional vehicles we can quickly reference these measurements to ensure that the vehicles have identical placement. When vehicles in a fleet are parked next to one another, discrepancies in placement become obvious. By noting and follow- ing established measurements you ensure a consistent and professional install. SDG We use a media cataloging program to make it faster and easier to find archived art files.